I’m using this to give as gifts to our neighbors this Christmas. And of course saving some back for me. 🙂 Here is what I’m printing out to add with the gift. Enjoy this on toast, biscuits, scones, or add it to a cheese plate. Use it as a glaze for grilled chicken or pork, or on sandwiches. Or just eat a spoonful of it. Merry Christmas from the ***** family! P.S. It will be good kept in the refrigerator for up to a month – if it lasts that long. Put all the ingredients in a crockpot and stir to combine well. Turn on high. Let it cook for about 2 hours or until the cranberries are soft. Remove the cinnamon sticks and puree until creamy using the emersion blender. Replace the cinnamon sticks and cook with lid ajar until thickened, approximately another 2 hours, stirring occasionally. Remove the cinnamon sticks. Using a large strainer and ladle (like a really large tea strainer) or straining cloth, strain out the stringy bits. 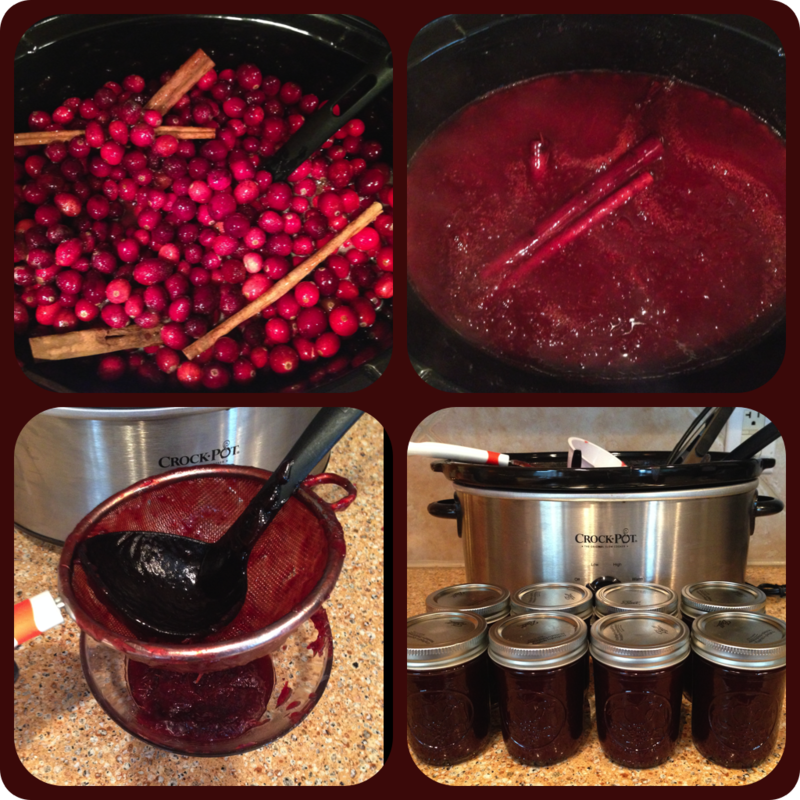 Put the cranberry butter into clean jars with tight fitting lids and let cool. Store in the refrigerator and use within a month. *The rind from the lemon and oranges give a good balance of tart to the sweet. Stove top: Bring to a low boil. Let it boil for 10 minutes. Then reduce heat and simmer for an hour or so. 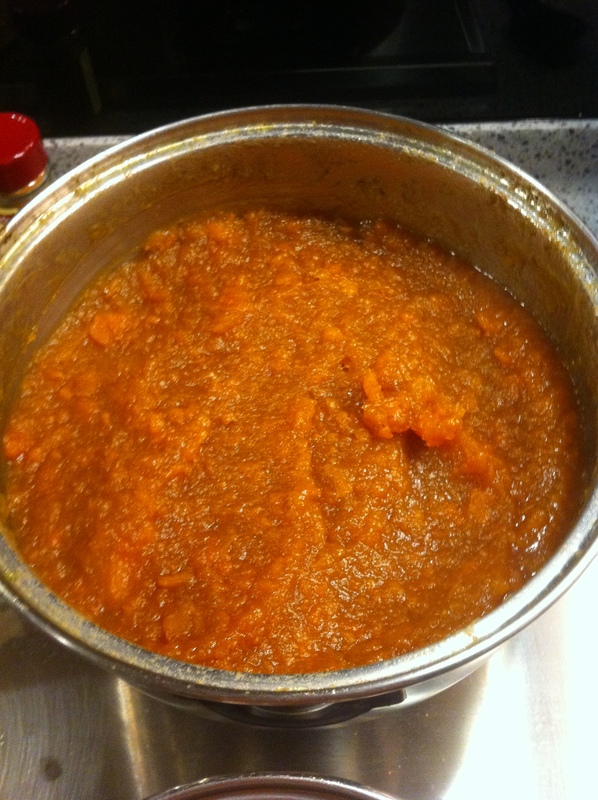 Crockpot: Put all ingredients in a large crockpot and cook on high until sugar is dissolved. Then simmer on low for at least an hour but you can leave it in your slow cooker for much longer and serve from it. This is one of those recipes where you taste and add. So start with less of something if you’re unsure and you can always add more. I like to keep a dish of red hots beside the mugs when serving. The red hots give it a stronger cinnamon flavor and make it a pretty red color. Be sure to serve the liquid only. Downing a whole clove is not enjoyable or tasty. Refrigerate leftovers (liquid only) and reheat. Leaving the cloves and cinnamon and other bits in the liquid for too long will make the flavors too strong. We love to make mulled wine the real way but if you want a cheater version of mulled wine, add a bit of red wine (whatever kind you like) to your mug before adding the wassail. Maybe about 1 part wine, 2 parts wassail. Drink responsibly. Now “My Wassail” is your wassail too! I don’t know when or why I started making these but it’s been many years. Every time I make them people are fascinated by them. They ask what it is. I smile and say, “try it”. They say, “Is that a cranberry?” And then, “Oh my goodness! These are SO good!” And then, “How did you make these?!? !” And then again, “Are these FRESH cranberries?? ?” I hear all the time, “I didn’t know you could eat fresh cranberries.” The thing is, who would want to? haha! They are so tart they have to be in something…. or coated with sugar. 🙂 The antioxidant goodness outweighs the sugar badness, right? So here is how I make these. They make a huge impact treat with very minimal effort. 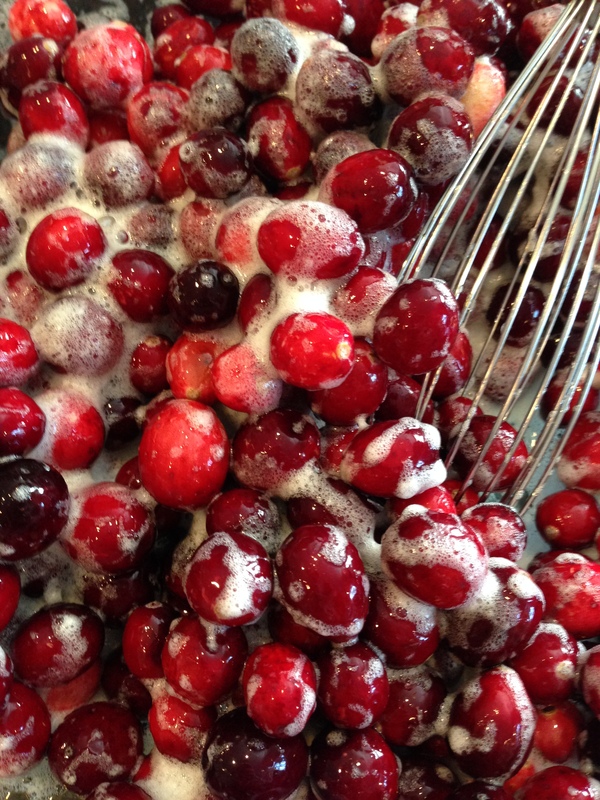 Prep: wash the cranberries ahead of time and give them plenty of time to dry completely. If they are wet the egg whites won’t stick. 1. Beat your egg whites with a whisk or electric beater until they are light and fluffy, not too stiff. 2. Carefully fold the fresh cranberries into the egg whites just enough to coat. 3. Place half of the bag of powdered sugar in the bottom of a gallon sized ziploc. 4. Give the cranberries one last quick fold in the eggs whites and then spoon them on top of the powdered sugar in the ziploc. Leave any excess egg whites in the bowl. 5. Put the rest of the powdered sugar on top of the cranberries. 7. Put them in cute holiday dish and serve and enjoy the smiles as these little sweet and sour surprised pop in your mouth. They will be nice and pretty for about a day before getting soggy. Don’t put them in the refrigerator as they will get soggy as they get back to room temperature. This is definitely the easiest thing I make for our Thanksgiving dinner. It’s one of those dishes where you either like it or you dislike it but I happen to like it. A lot! Only you can’t eat a lot and you’ll see why when you read the ingredients, so I don’t make too much of it. 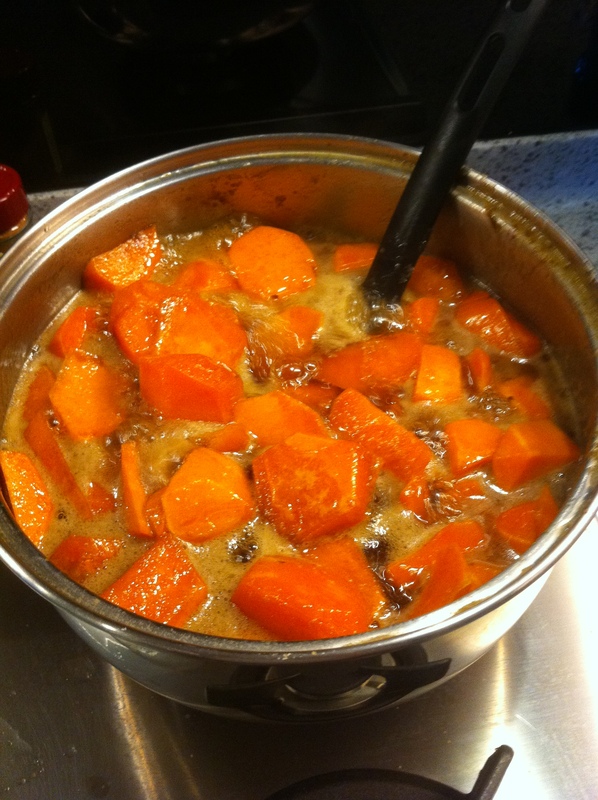 *Place peeled/cubed sweet potatoes in a saucepan, large enough to leave a little room for the butter and sugar. *Cube up the butter and put on top of the sweet potatoes. 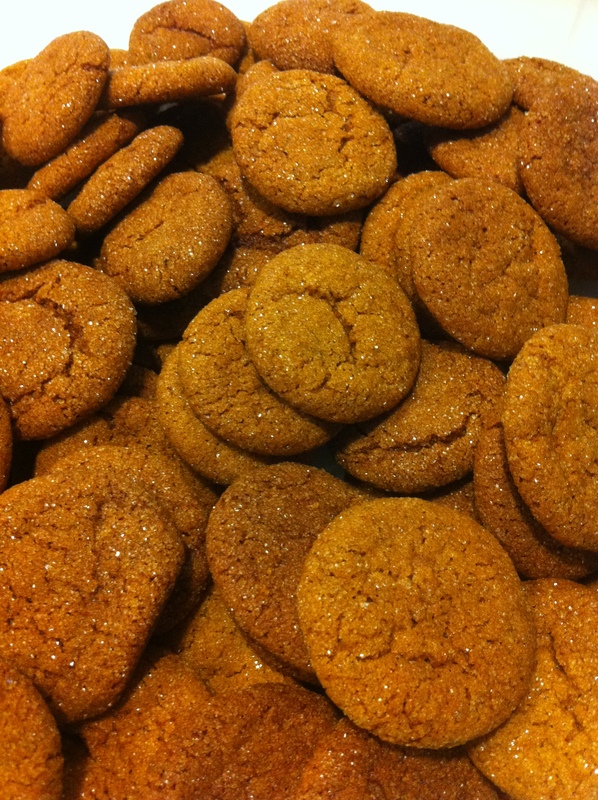 *Pile in the brown sugar and stir as best you can just to get a little bit of it down to the bottom. *Put the lid on the pan and simmer on low to medium, stirring occasionally, for about 30-45 minutes or until potatoes are cooked soft. *Mash with either a fork or a potato masher. *At this point you can either leave in the saucepan or put into a baking dish. *Place miniature marshmallows on top to generously cover. If you put into a baking dish put it in the oven until the marshmallows brown. If you’re leaving it in the saucepan, the marshmallows will just melt. This is a typical part of our meal but it’s sweet enough to be a dessert. These are definitely one our of family’s holiday favorites! One batch of the dough makes like a billion bite-sized cookies so you will have plenty in your holiday cookie jar and plenty to share. Note: This recipe can be made gluten-free by simply substituting the flour with all-purpose gluten free flour. In a mixing bowl, cream butter and sugar. Add eggs one at a time, beating well after each addition. Add molasses and other ingredients; mix well. Chill overnight. Shape into 1/4 inch balls; roll in sugar or cinnamon sugar. Place 2 inches apart on ungreased baking sheets. Bake at 375 degrees Fahrenheit (190 Celsius) for about 6 minutes or until edges begin to brown. Cool for 2 minutes before removing to wire rack. For dip, beat softened cream cheese till smooth. 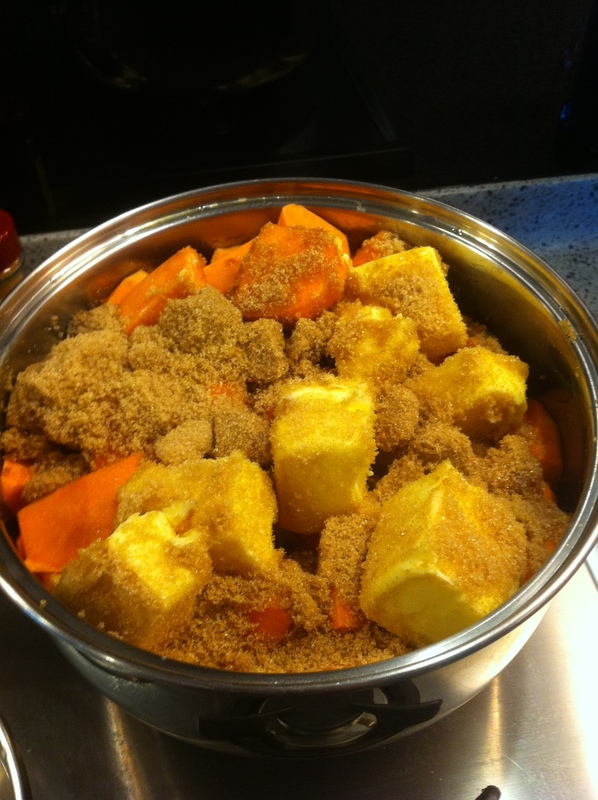 Add pumpkin pie mix; beat well with electric mixer. Add sugar, cinnamon, and ginger; beat till smooth. Serve with cookies. Store leftover dip in the refrigerator. Makes about 20 dozen cookies and 3 cups dip. Note: These amazing little dough balls can be made ahead and frozen or kept in the fridge for a while until you need them for a party or gathering. Update: I added the American conversions to the recipe. I did make these cookies and they were good. By American cookie standards, they weren’t very sweet and they were sort of dry but that is mostly what we find in Asian desserts. They’re not as big on sweets as we Americans are and they aren’t as “big” in general as we Americans are either. 🙂 I also added a tiny bit of Almond Extract. The recipe didn’t make 90 cookies and I made them small but probably not small enough. CNY treats are very petite. This is my picture. Clearly you can see that hers are better or at least her camera is. 🙂 And mine are on a paper plate and hers are on a cute little China plate. They didn’t last long with my son’s friends over so it wasn’t worth washing a dish. In Singapore right now, everything is Chinese New Year. Red lidded plastic containers with red and gold labels filled with traditional pineapple tarts, prawn rolls and other things that I don’t know the names of. We did buy some peanut pastries yesterday, fried little pastry dumpling looking cookies with crushed peanuts in the middle. Kind of bland for my taste but quite delish with a dab of Nutella! 🙂 World Nutella Day is on CNY weekend so I thought it would be ok to combine the two. 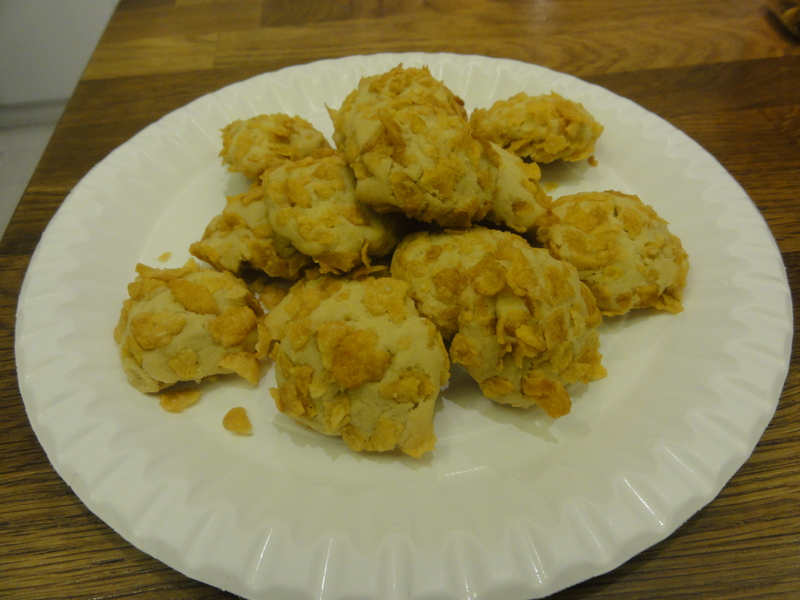 Anyway, I have this blog (that I really like) in my Blog Reader, Mrs. Multitasker, and she posted a recipe for Chinese Cornflake Cookies. Apparently it’s a traditional CNY treat that is not sold widely like the others are so I hadn’t heard of it. But they look yummy. I’m going to Cedele’s to get some and then I will try the recipe for myself. And I might add a dab of Nutella. 🙂 I have to mention that I LOVE that this is a Chinese cookie made with American cereal. Makes my heart smile to unite these two cultures in one bite. Then add Nutella and it’s a mouthful of cultural bonding. 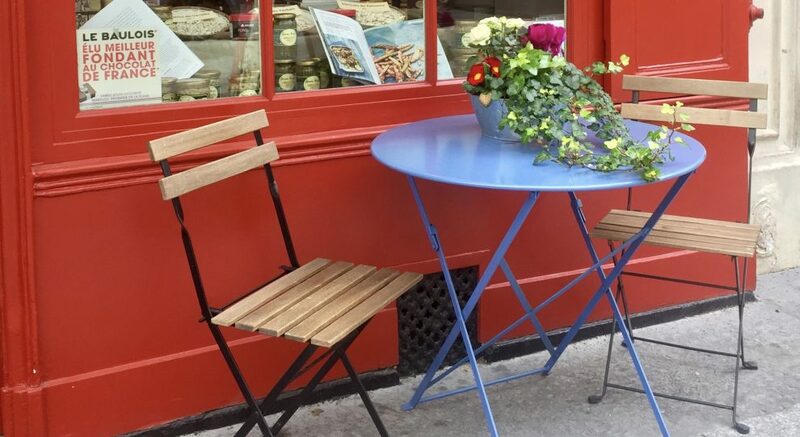 She mentions a few other cool things in her blog post as well so go take a look. I will be ordering pineapple tarts next year from The Hiding Place. I love to support a ministry and get goodies in the process! 1. 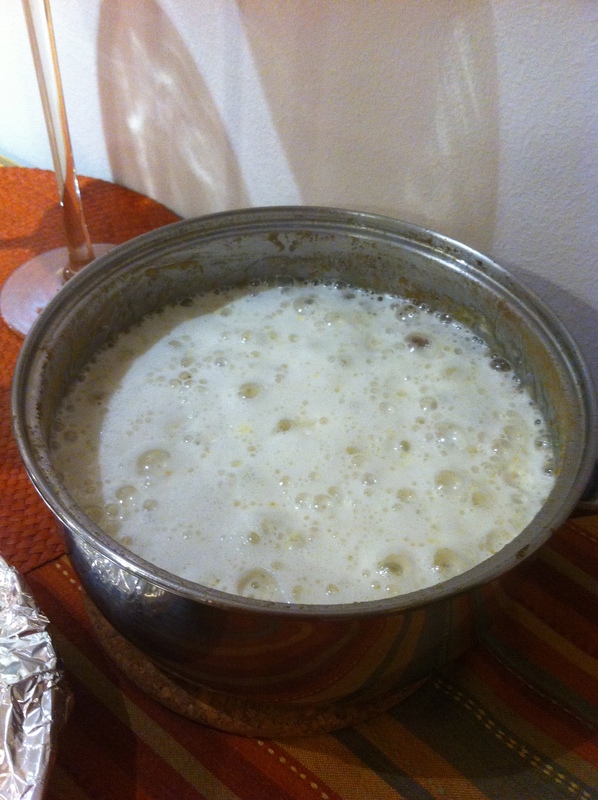 Sift the icing sugar into a mixing bowl, then drop the pieces of butter into the bowl on top of the sugar. Fit your mixer with the paddle attachment, then beat the butter and icing sugar on low speed for about 10 seconds (to prevent your icing sugar from flying all over your kitchen) before increasing the speed to medium and beating for another 20 seconds or so. Scrape down the sides of the bowl. 2. Add the egg yolks and vanilla essence and beat for another 30 seconds. Scrape down the sides of the bowl again. Sift the cake flour into the mixing bowl, add the salt, and beat for another 30 seconds. 3. Pre-heat your oven to 175 degC. Prepare your cornflakes by putting them into a ziploc bag, then using your fist to pound on the bag gently so the cornflakes are roughly crushed. Pour the cornflakes into a medium-sized bowl. 4. Use a teaspoon to scoop up half a teaspoon of batter, and use another teaspoon to release the batter into the bowl of cornflakes. Use your fingertips to roll the ball of batter around till it is covered in cornflakes. Place the coated batter onto a baking tray lined with parchment paper, and repeat with the remaining batter. 5. Bake cookies for 22-24 min.